After I wrote the post about my engagement ring, I browsed on Pinterest for about 2 hours looking at all the pretty gems. 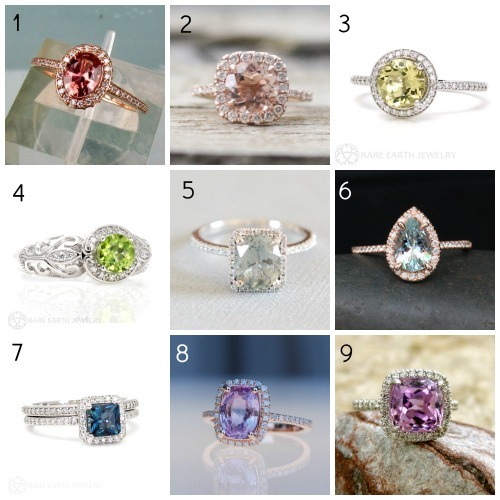 I am just in love with the look of colored engagement rings so much, that I put together a rainbow of colored stones for you to look at. SO... for your viewing pleasure. Here are some beautiful, sparkly pieces that would be amazing on any bride. What do you think? Colored stones or diamonds? Or both!? I love colored diamonds!! But I think for an engagement ring I want a clear diamond, I'm old school in that department. I am completely non-traditional, so for my first engagement (yes, you heard that right--I've been engaged twice, but only married once!) I was delighted when my fiance gave me this gorgeous blue diamond ring. Oooh, parting with that ring when we split was SO hard since I loved it a ridiculous amount! On the second go round, my now-husband wanted to get me another blue diamond since I loved the first one so much, but we agreed it was best to go with something new. So, now have a clear diamond but in a unique setting. I just love the rose gold on that first ring!! I have a close friend who got a ring a lot like #6 and it's seriously GORGEOUS!! Thanks so much for linking up with us! These are all beautiful! My niece is one of those non-traditional people who does not want any ordinary wedding! I don't blame her, a wedding is suppose to be the biggest day of your life.Why go ordinary ! I love the idea of colored wedding rings/ engagement rings. My original was pawned during a time of struggle years ago and I am hoping to get a special one sometime in the future. I never was really into colored stones for an engagement. To be honest, I'm still not. The green, round cut ring (top left) is adorable all the same. Totally fair!! To each his own! I love the idea of anniversary rings. I would love to add an anniversary band or something. :) I think it's all about personality. I totally could also see myself wearing a clear diamond, so it's really always different. Rose gold is absolutely my favorite. I think it is so under appreciated. I LOVE that pear cut!! A unique setting is pretty! As long as it's special to you, that's all that matters. Hey, as long as it is something that you love, and will love wearing every day. I don't think I could have done a dark color and worn that every day. haha! I keep joking with Dave that for our anniversary I want more diamonds!! !